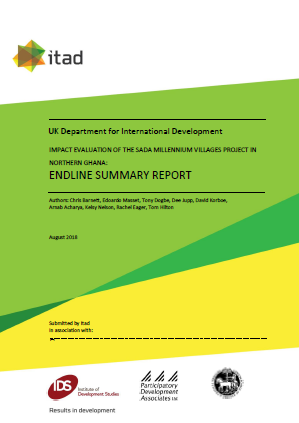 This report presents the endline findings from an impact evaluation of the Millennium Villages Project (MVP) in northern Ghana, as commissioned by the UK Department for International Development (DFID). The Ghana project ran from May 2012 until December 2016, with interventions targeting a cluster of 35 communities with the aim of achieving the Millennium Development Goals (MDGs) – eight globally endorsed targets that address the problems of poverty, health, gender, equality and disease. This is the first Millennium Village (MV) to be accompanied by an independent impact evaluation, and the findings have broader appeal to those seeking to address the root causes of extreme poverty by taking a holistic, community-led approach to sustainable development – such as the Earth Institute’s Centre for Sustainable Development, which aims to translate the Sustainable Development Goals (SDGs) into meaningful policies and solutions. The MVP has been designed to demonstrate how an integrated approach to development can translate the international MDGs into results, and sustainably address extreme poverty. MVP was spearheaded by Professor Jeffrey Sachs, while Director of the Earth Institute at Columbia University, working closely with the United Nations Development Programme (UNDP) and a range of donors. MVP has previously been piloted in Kenya and Ethiopia, and in 2006 launched at scale to reach nearly half a million people in 10 countries across sub-Saharan Africa. This final report is based on five survey rounds of household (and other) data collected from 2012 to 2016, as well as three qualitative studies that were undertaken during the baseline (2012), midterm (2014) and in the final years (2016-17). The analysis highlights changes compared with the baseline and isolates impacts that can be attributed to the MVP through the use of control groups. Read the executive summary, briefing papers and annexes on our resources page.